Israeli soldiers shot, Wednesday, a young Palestinian man with a gas bomb which struck him directly in the head, east of Khuza’a town, east of Khan Younis, in the southern part of the Gaza Strip. 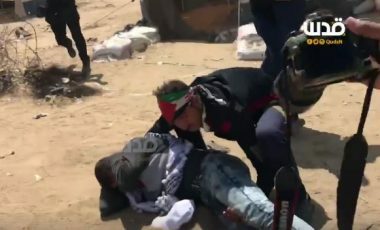 Media sources in Gaza said the soldiers advanced dozens of meters into Palestinian lands east of Khuza’a, and fired live rounds and high-velocity gas bombs at Palestinian protesters. The Quds News Agency said the soldiers shot a young man with a gas bomb, directly striking him in the head, causing a moderate injury, before medics rushed him to the European Hospital. In related news, the soldiers bulldozed Palestinian lands in the area, and installed sand hills, in addition to adding more barbed-wire fences near the border, east of Khuza’a.